There’s been a changing of the guard in the U.S. House of Representatives. In January, Representative Eddie Bernice Johnson, a democrat from Texas, took over as chair of the House Committee for Science, Space, and Technology from her predecessor Lamar Smith. Smith was in charge of the House Science Committee for six years—an era that was defined by partisan attacks on climate science, and the issuing of congressional subpoenas to scientists. Now under new leadership, Chairwoman Johnson is looking to restore credibility to the House Science Committee, listening to the scientific consensus on climate change and aiming for bipartisan oversight of scientific programs. But how much progress will the new committee make when it’s up against an administration that’s been hostile to many of the agencies that conduct scientific research? Chairwoman Johnson joins Ira to talk about bringing science back to the committee, changes she plans to make from previous leadership, and her thoughts on the President’s stance on climate change. On educating committee members about science. Eddie Bernice Johnson: In many ways yes [Johnson has to educate committee members on science], but we have a number of scientists and persons with scientific backgrounds that have joined the committee, which helps a great deal. We have different and new members as well on the Republican side. And so I feel very good that we’re starting out on a very positive note. I don’t believe that what we are experiencing now with all this weather change and the kind of responsibilities that we are picking up with all the damage—I just can’t imagine anybody not wanting to look into what helps with that, what changes that, what saves the dollars. Prevention of course will be a focus. It’s common sense to me. So that’s why I just feel positive that we’ll be able to get this message over. Someone who has gotten themselves elected to Congress really ought to have enough intellect to understand what we are talking about and what the research shows. On facing budget cuts issued by President Trump’s administration. Eddie Bernice Johnson: One thing I can say about the president, he has made sure that he’s recommending cuts to almost everything we are trying to do on this committee. We’ve got to discuss that with him, so we hope that he will have people available to us to explain why he wants to shut the door to the future. We have the jurisdiction of NOAA that does all the weather reporting, the National Science Foundation, EPA, the Department of Energy. EPA’s funding has been recommended to be cut severely and even roll back some of the changes that have been made to move us forward. The National Science Foundation has been very irritated by the interference with these scientific grants that go out, that provides us with the research that we need so badly to move forward. We have an educational responsibility to educate the president and his cabinet in these particular areas and we hope that we’ll be given the opportunity to do that. @scifri more seriously: how will you value and promote basic research? Often these studies are the ones targeted by anti-science pundits and pols as “useless” but doing science without basic research is trying to build a house starting at the roof. On investing in basic scientific research. Eddie Bernice Johnson: We feel so strongly about the positiveness of what we get from research, what we’ve gotten from research, what is it meant to us, not only through health care, but through all types of increases in our economy. And just think about how many simple things have come from wireless technologies—all of this started through basic research. You know I live in an area where there’s Texas Instruments who developed the chip. That semiconductor has changed the way we live. We can carry little computers in our hands now that we call a mobile phone and get any kind of information we want. That didn’t just happen. It happened because human beings did the research and came up with the technology. On the House Science Committee’s stance on the Green New Deal. Eddie Bernice Johnson: The committee has not taken a stand on that Green New Deal. There’s a select committee on environment that is charged with that responsibility. However we’re working together with all of the committees that are looking at the climate change and what we need to do to address the issues we’re experiencing. It is global. We can’t do it all alone. But what we are noticing is that we’ve got to catch up with China. They’re investing heavily while our administration is pushing back. We can’t afford that. We’ve got to address it. On the impact of NASA. Eddie Bernice Johnson: NASA has been one of the greatest investments we’ve ever made. For every dollar that has been spent in NASA, we have gained back at least five dollars from the investment. So I know there are many people that don’t understand all that we’ve gotten from NASA’s space research, but it has been phenomenal—it’s been the greatest investment this nation has ever made. And we do need to go back to the moon. We need to look at what we are going to do with the space station, which has been quite a place of research and sharing around the world. And you know we’re trying to get to Mars by 2030. We have been the committee that’s opened the door to the future through all of the research endeavors that this committee covers. But NASA has absolutely been the best investment the nation has made. All of the satellites that NOAA uses to predict the weather came from NASA, the robots, and so many innovations that we did continue to make in order to be competitive in the world. Eddie Bernice Johnson: We’ve had hearings on education and whether we are ready to go into the future. We are building this talent for the next generation. And what we are finding is that under this administration, they’ve cut out much of the education component of NASA. NASA has been one of the most inspiring agencies for young minds since its beginning. We have got to make sure that our young people are oriented to STEM education from preschool all the way through the rest of life to make sure that we’re getting the critical thinkers, we are making good of imaginations, and giving opportunities for all the innovations that we have already done, but all those that we must do to remain competitive. We are about to lose our competitive edge in the world. I’m determined that we should not do that. Correction 3/22/2019: A previous version of this page stated that Representative Lamar Smith had declined our invitations for an interview. Congressman Smith was interviewed as a guest on Science Friday on March 1, 2013. We regret the error. Learn more about Chairwoman Eddie Bernice Johnson. Read about Rep. Johnson’s initiatives as she heads up the House Science Committee in Science magazine. Find out how Rep. Johnson got her start in politics on NBC 5 News. Learn about the other representatives with STEM backgrounds who have recently joined Congress. 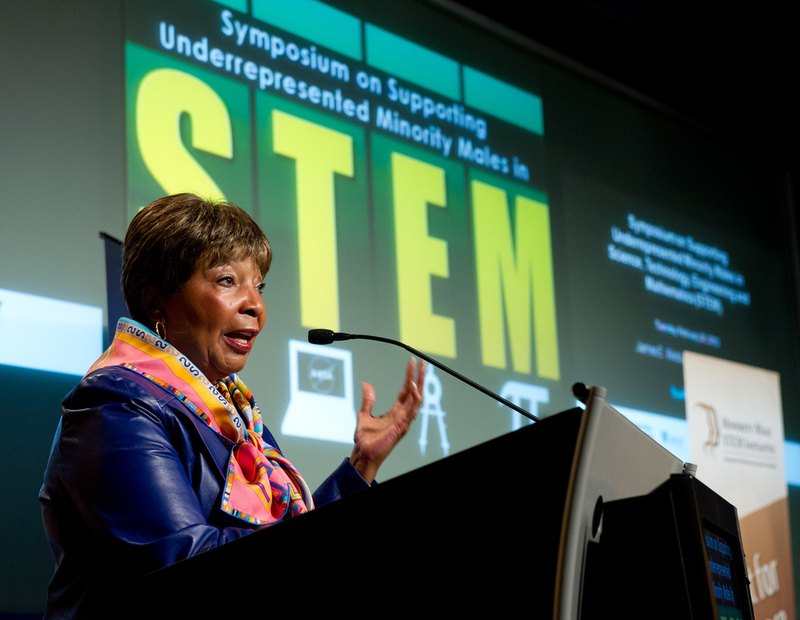 Eddie Bernice Johnson is a member of the US House of Representatives (D-TX) and Chair of the House Committee on Science, Space and Technology. She’s based in Dallas, Texas. IRA FLATOW: This is Science Friday. I’m Ira Flatow. There’s been a changing of the guard in the US House of Representatives. A little less than three months ago, Congresswoman Eddie Bernice Johnson, a Democrat from Texas, took over as chairwoman of the House Committee for Science, Space, and Technology from her predecessor, Lamar Smith. Smith was in charge of the House Science Committee for six years in the era that was defined by partisan attacks on climate science and the issuing of congressional subpoenas to scientists. Now under new leadership, Chairwoman Johnson is looking to restore credibility to the House Science Committee– listening to the scientific consensus on climate change, aiming for bipartisan oversight of scientific programs. But how much progress will the new committee make when it’s up against an administration that’s been hostile to many of the agencies that conduct scientific research? Well, joining me now to talk about bringing science back to the House Science Committee is Chairwoman Eddie Bernice Johnson, coming to us from her home district in Dallas. Welcome to Science Friday. So glad you could take time to be with us today. EDDIE BERNICE JOHNSON: Thank you very much. I’m delighted to be here. IRA FLATOW: What drew you to the House Science Committee when you first came to Congress so many years ago? EDDIE BERNICE JOHNSON: Well, I’m from a science background. I’m a nurse. And I was interested in the scientific research. And, at that time, that was very open to me. And so I decided to accept the invitation and join. And I’ve been fascinated by the committee and the content, all of the areas that are under the jurisdiction of this committee. We’ve had some dynamic chairs. And we’ve had some interesting chairs. We just finished six years of a science denier. But I think that we’re going to get on track. So far, we have begun to move ahead. We’ve had the status of science hearing. We’ve had the status of climate change, climate science, and the status of STEM education, which has been a longtime interest of mine because I think that is the future. IRA FLATOW: Let me follow up on that STEM education. I know there’s something called the STEM Act. The building blocks of a STEM Act is in a bill introduced by Congresswoman Haley Stevens from Detroit, I think, and Congressman Jim Baird of Indiana in the House. And she writes, Stevens writes, will strengthen early childhood STEM education, lead to more effective policies and practices to increase the number of women in our STEM workforce. You agree with all of that. EDDIE BERNICE JOHNSON: Oh, indeed. As a matter of fact, that’s been our focus a long time. I’m delighted to have her. She’s very enthusiastic. As a matter of fact, we have a very energetic committee that’s very interested in getting started. And I’m excited to work with all of them. IRA FLATOW: And you seem to be having bipartisan support in some of these bills. That is something refreshing, is it not? EDDIE BERNICE JOHNSON: Indeed, it is. You know, I don’t know what happened. But I can say that, so far, we’re not getting the pushback that we were accustomed to having the last six years. The chairman, the ranking member Congressman Lucas from Oklahoma and I have worked on this committee a number of years together. We’ve shared trips to go to research labs around the world. And I think he is a little bit more open and pragmatic in accepting our scientific findings. He happens to be a farmer from Oklahoma. But he is not a negative person. I’m delighted that we’ve been able to make some plans to work together. IRA FLATOW: And you know, you’re familiar with the news this week that suggests President Trump has been resistant in giving congressional committees information they’re asking for. Do you think you will be running up with that same kind of resistance? Or will you have more success with your committee requests? EDDIE BERNICE JOHNSON: Well, we’ll see. One thing I can say about the president– he’s made sure that he’s recommending cuts to almost everything we’re trying to do on this committee. We have got to discuss that with him. So we hope that he will have people available to us to explain why he wants to shut the door to the future. IRA FLATOW: Can you give us an idea of what kinds of cuts you’re talking about? EDDIE BERNICE JOHNSON: Well, you know, we have the jurisdiction of NOAA that does all the weather reporting, the National Science Foundation, EPA, the Department of Energy. EPA’s funding has been recommended to be cut severely and even roll back some of the changes that have been made to move us forward. The National Science Foundation has been very irritated by the interference with these scientific grants that go out that provides us with the research that we need so badly to move forward. We have an educational responsibility to educate the president and his cabinet in these particular areas. And we hope that we’ll be given the opportunity to do that. IRA FLATOW: Do you think, because you are a science committee and you have to have a wide ranging impact with science, do you have to educate your committee members about science? EDDIE BERNICE JOHNSON: In many ways, yes. But we have a number of scientists and persons with scientific backgrounds that have joined the committee, which helps a great deal. We have different and new members as well on the Republican side. And so I feel very good that we are starting out on a very positive note. I don’t believe that what we are experiencing now with all this weather change and the kind of responsibilities that we are picking up with all the damage, I just can’t imagine anybody not wanting to look into what helps with that. What changes that? What saves the dollars? Prevention, of course, will be a focus. It’s common sense to me. So that’s why I just feel positive that we’ll be able to get this message over. Someone who has gotten themselves elected to Congress really ought to have enough intellect to understand what we’re talking about and what the research shows. IRA FLATOW: That’s interesting. I couldn’t agree with you more. We had the new NASA administrator on a couple of weeks ago. And he talked about his budget for wanting to go back to the moon as one of his high priorities. How do you see– since you’re in control of the NASA budget, what are your priorities for NASA? EDDIE BERNICE JOHNSON: NASA has been one of the greatest investments we’ve ever made. For every dollar that has been spent in NASA, we have gained back at least $5 from the investment. So I know there are many people that don’t understand all that we’ve gotten from NASA and space research. But it has been phenomenal. It has been the greatest investment this nation has ever made. And we do need to go back to the moon. We need to look at what we’re going to do with the space station, which has been quite a place of research and sharing around the world. And we’re trying to get to Mars by 2030. We have been the committee that’s opened the door to the future through all of the research endeavors that this committee covers. But NASA has absolutely been the best investment the nation has made. All of the satellites that NOAA uses to predict the weather came from NASA– the robots and so many innovations that we need to continue to make in order to be competitive in the world. IRA FLATOW: We have a tweet. Phone calls are coming in. Our phone number is 844-724-8255. We have a tweet from Eileen Shabu. It says, how will you value and promote basic research? Often, these studies are the ones targeted by anti-science pundits and polls as quote, “useless.” But doing science without basic research is trying to build a house starting at the roof. EDDIE BERNICE JOHNSON: I couldn’t agree more. And yes, we do get targeted. But we feel so strongly about the positiveness of what we get from research, what we’ve gotten from research, what it has meant to us not only through health care but through all types of increases in our economy. And just think about how many simple things have come from wireless technologies. All of this started through basic research. You know, I live in an area where there’s Texas Instruments, who develop the chip. That semiconductor has changed the way we live. We can carry little computers in our hands now that we call a mobile phone and get any kind of information we want. That didn’t just happen. It happened because human beings did the research and came up with the technology. IRA FLATOW: You’ve said that climate change is a key issue the US needs to address. Does the House Science Committee have a plan for policies it wants to support or legislation it will introduce to address climate change? EDDIE BERNICE JOHNSON: We’re working in that direction. We are working on legislation. We are trying to make sure that we cover all our bases in getting the research out, visiting where we do have research going on. And I must tell you that the corporate industry has shown as much interest in finding answers as others. The CEO of ExxonMobil was the first one to visit me after the election. And ExxonMobil has a fantastic research lab in New Jersey that we plan to visit. We plan to move in concert with our basic researchers and listen to that research so that we’ll have a clear path. We know that we are dealing with much of climate change globally. It didn’t get this way overnight. And we’re not going clear it overnight. But we own the path to address it. We need to. The only way we can save dollars with all of the damage we are experiencing is to do the research and implement. IRA FLATOW: Madam Chairwoman, does the committee take a stand on the Green New Deal at all? Or are you just sitting and waiting for more of it to be– to see what comes out of it? EDDIE BERNICE JOHNSON: The committee has not taken a stand on that Green New Deal. There’s a select committee on environment that is charged with that responsibility. However, we are working together with all of the committees that are looking at the climate change and what we need to do to address the issues we’re experiencing. It is global. We can’t do it all alone. But what we are noticing is that we’ve got to catch up with China. They’re investing heavily while our administration is pushing back. We can’t afford that. We have got to address it. When you think of all of the dollars it costs us to clean up behind these major weather catastrophes, we must learn how to prevent it. And we must learn how to withstand it. You know, we’ve got to deal with resilience of materials. We’ve got to predict better when we’re expecting it. We’ve got to plan how we’re going to build and where we’re going to build. And we also have got to make sure that all this water that is causing these floods is also water we need for drinking. So we’ve got a lot on our plate. But we can do it if we have administrations that will put people in place in these agencies that move ahead with the research and not try to stop it or deny it. IRA FLATOW: I’m Ira Flatow. This is Science Friday from WNYC Studios talking with the chair of the House Science Committee, Eddie Bernice Johnson. You know, you come from Texas. You remember Lyndon Johnson and the space programs. Got it right there, in Houston. Do we have– how can I put it, anyway? Do we have the will and the way to create new, big programs that are going to take a decade to finish without politically being chopped up along the way? EDDIE BERNICE JOHNSON: Well, I hope so. But that’s been one of our problems. We move ahead. And then we get pushed back. We were moving ahead under the last administration. We felt nothing but push back under this one. But we cannot cave into it. We are a major branch of government that have direct responsibilities to the citizens of this nation. We must move ahead. We cannot afford to sit here and let all this happen without addressing it, without looking for answers, without looking for ways to bring it about, without breaking the bank, but also without destroying our total economy. And say we just sit back and do nothing. We can see what all of this damage will do with these massive floods, all of these fires. We’ve got to address these issues. We cannot wait for them to just go away, because they’re not going to go away. They’ll get worse unless we address it. We have a basic responsibility to the world and to our nation to do it. And I’m determined that, as the committee having much of the responsibility for these measures, we’re going to get there. We’re also working within the other committees that are addressing some of the same issues. We’re dealing with Energy and Commerce as well as Natural Resources and any other committees where we overlap. We intend to be serious about the people’s business of dealing with health and all the risks that we take when we ignore what’s going on globally. IRA FLATOW: Do you have a priority set? What would you like to work on first? There’s so much here to work on. How do you decide what comes first? EDDIE BERNICE JOHNSON: It’s difficult sometimes. We know this. We know that one of the number one priorities is look at where we are and challenge where we have to go. We’ve already had hearings on the status of science. We’ve had hearings on the status of a global environment. And we’ve had hearings on education and whether we are ready to go into the future. Are we building this talent for the next generation? And what we’re finding is that, under this administration, they’ve cut out much of the help, much of the education component of NASA. NASA has been one of the most inspiring agencies for young minds since its beginning. And you mentioned President Johnson. President Johnson was one of the major leaders in getting us the major research on where we are now and also focusing on education. We have got to make sure that our young people are oriented to the STEM education from preschool all the way through the rest of life to make sure that we are getting the critical thinkers, we are making good of imaginations, and giving opportunities for all the innovations that we have already done, but all those that we must do to remain competitive. We’re about to lose our competitive edge in the world. I’m determined that we should not do that. IRA FLATOW: Well, I want to thank you very much for taking the time to be with us. You’re the first chair of the committee to come on in six years on our show. it’s been a long drought. Eddie Bernice Johnson, who is chair of the House Committee for Science, Space, and Technology, thank you. And you’re welcome to come back anytime you’d like. EDDIE BERNICE JOHNSON: Well, thank you very much. I’m sure I will. Thank you very much. The rentier mentality wants cheap labour, by way of the underskilled. Our Dixie Brahmin especially, plantation politics. They hate uppity tradesmen, but it’s going to be the IBEW doing the solar buildout in Dixie. So we have a choice: Race to the bottom, or get on the bus.